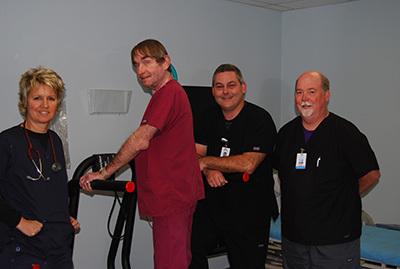 The Cardiopulmonary Department performs all routine respiratory therapy duties including BiPAP therapy, pulmonary function testing, EKG's, holter monitoring, Vo2Max testing, as well as cardiac stress tests. These services are provided through the hospital including the Specialty Clinic. Respiratory Therapy: Most people take breathing for granted. It's an involuntary reflex. But for those who suffer with breathing problems, each breathe is a major accomplishment. These people may be suffering from a chronic lung disease, or have acute problems, which can be reversed with respiratory treatments. BiPAP Therapy: BiPAP (also referred to as BPAP) stands for Bilevel Positive Airway Pressure, and is very similar in function and design to a CPAP machine continuous positive airway pressure). A BiPAP machine is a non-invasive form of therapy for patients suffering from sleep apnea. The machine delivers pressurized air through a mask to the patient's airways. The air pressure keeps the throat muscles from collapsing and reducing obstructions by acting as a splint. The BiPAP machine allows patients to breathe easily and regularly throughout the night. may recommend an EKG for various reasons, including chest pain, shortness of breath, dizziness, and irregular heartbeat. while doctors monitor your blood pressure and heart rhythm. person's medical condition, a doctor may use an intravenous medication called dobutamine. Pulmonary Function Test: PFTs measure the health of your lungs, and enable your doctor to detect changes in respiratory function. electrical activity. A diary of activities performed and how the patient fells while wearing the monitor, is kept for the doctor's review. have been any abnormal heart rhythms. The Cardiopulmonary Department is located on the 1st floor West, next to the Emergency Department. For more information about the Cardiopulmonary Department, contact Frank Cline at 618-439-3161, ext. 9630 or email frank.cline@franklinhospital.net.